Please contact paulo.talkevent@gmail.com for registration. Paulo Monteiro was born in Sao Paulo, Brazil in 1961. He graduated from the Department of Visual Art, College of Fine Arts in Sao Paulo, where he currently lives and works. He started working as an artist in 1977, publishing in magazines drawings influenced by Robert Crumb amongst others. Monteiro started painting after being impressed by the work of Philip Guston in 1981, and became one of the founding members of “Casa 7” that aimed for a renaissance of Brazilian painting. In 1985 he took part in the Sao Paulo Biennial, by which time the group’s Neo-Expressionism was becoming mainstream within the art scene in Brazil. In 1986 he started creating sculptures using pipes and wood. 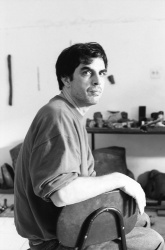 He participated in the Sao Paulo Biennial with the lead pieces in 1994, and received the Bolsa Vitae de Artes Visuais Award in 1999. In 2000 he started painting again, and held a large survey show at the Pinacoteca do Estado de Sao Paolo in 2008. In 2014 MoMA acquired 20 works by Monteiro. He has shown extensively in Brazil and internationally. His work is included in numerous public collections including those of MoMa, the Museu de Arte Moderna de Sao Paulo, the Pinacoteca do Estado de Sao Paulo, and the Museu de Arte Comtemporania da Universidade de Sao Paulo.